A voiturette is a miniature automobile. Voiturette was first registered by Léon Bollée in 1895 to name his new motor tricycle. The term became so popular in the early years of the motor industry that it was used by many makers to describe their small cars. The word comes from the French word for "automobile", voiture. Between World War I and World War II light-weight racing cars with engines limited to 1500 cc such as the Alfa Romeo 158/159 Alfetta, the Bugatti Type 13 and the original ERAs were known as voiturettes. In France, in the years after World War II a type of small three-wheeled vehicle voiturette was produced. In 1990s, voiturette became a French classification for a vehicle weighing less than 350 kilograms (770 lb) empty and carrying a load (i.e. passengers) of not more than 200 kilograms (~440 lb). The top speed is limited to 45 km/h (~30 mph) and engine size to 50 cc or 4 kilowatts for an engine of "another type" for example an electric car. Such vehicles are sometimes also called "motor quadricycles" or "motor tricycles". The driver's license for them is available to people over 16 years and is in category "B1" and is valid, subject to restrictions, in all European Union countries. French maker Renault's first car was simply called Voiturette, instead of the common usage then (it would have been called Renault 1¾ CV). 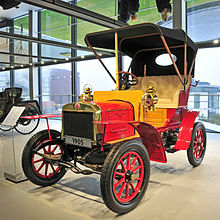 The 1900 model (Voiturette C) was considered the first ever sedan (a car with roof). This page was last edited on 31 March 2019, at 06:21 (UTC).